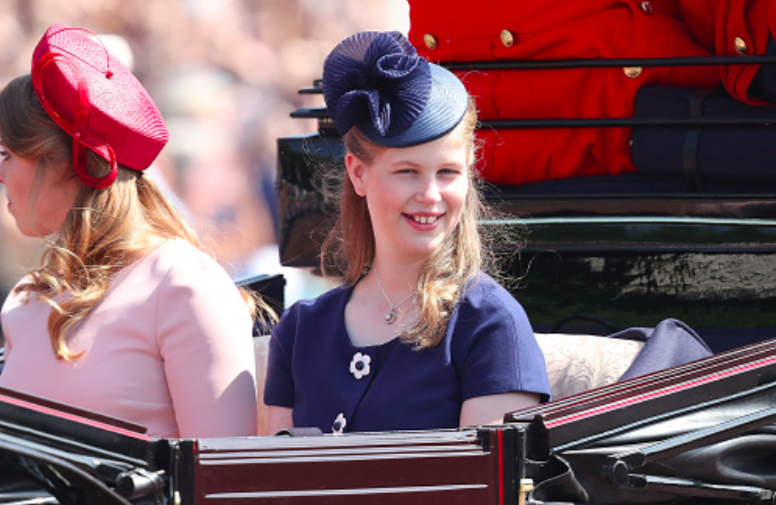 Lady Louise Winsdor rode in the carriage procession with her mother and cousins for Trooping the Colour this weekend, choosing a navy ensemble from Hobbs, and her second ‘real’ hat! Later she joined her grandmother The Queen and other members of the Royal Family on Buckingham Palace balcony. Lady Louise wore Hobbs ‘July’ dress, originally retailing for £99. The french-blue dress has a rounded neckline, t-shirt sleeves, a fitted waist and a very gradual a-line flare to the knee. The dress is perfectly tailored with flattering panels and a concealed zip at the back. The 1960’s vintage feel gives a fun vibe to this dress. Three white flower shaped buttons are placed down the centre, which add a dainty femininity to this dress, bridging the gap between girly and sophistication – the perfect combination for a teenage Royal. Lady Louise has worn this dress on two previous occasions. Lady Louise has the ability to look regal and elegant, whilst still looking age appropriate. The ‘July’ dress is sold out, though you can still view it here, and the jacket to match this dress – also with flowers – is still available here. A bit of an old school seamstress trick – if you love this dress and it’s sold out. Buy yourself a simple blue shift dress, pop down to your local haberdasher and purchase some large floral white buttons and sew them on yourself; or if you are not confident in your sewing skills, take them to an alterations store an ask them to sew them on for you! Tadah! Lady Louise wore a Jane Taylor cocktail hat. It was a navy round disc straw parasisal fascinator trimmed with matching navy twisted crinoline detail. Lady Louise’s hat design originally comes from Jane Taylor Spring/Summer 2014 Collection, however the pretty hat has been updated with a slightly more “poofy’ or twisted trim, as shown in the image below on the right. The ‘Stylophora’ with the blue and orange trim is the same as Lady Louise’s hat (but a different shaped base) and is currently available online at Jane Taylor. This is only the second time we have seen Lady Louise wear a cocktail hat. The first occasion was a few weeks ago at the Royal Wedding – you can see our piece on her look here. It was a repeat in the footwear department: Lady Louise wore her LK Bennett ‘Clemence’ blush heels, originally retailing for £192. We unusually got a look at Louise exiting her carriage (see here) to be able to give this info. The sensible heel height block pumps are created in blush suede and have a rounded toe that is gilded in gold toned hardware to give just that little something extra to this shoe. She has worn these heels to Easter Church Service this year and also owns them in black, seen at the recent Royal Wedding. You can get a very affordable replicate of these heels here. Lady Louise carried a Chloe ‘Mini Marcie Cross-body’ bag, retailing for £605. The saddle bag has a cross body strap, with double strap knotted closure through a gold-toned metal ring. The bag colour is described as pink, though it could be blush or almost beige. Three raised curved strips of leather form a horse-shoe shape with the designer name branded into the middle of the leather. A very fashion forward and on trend bag, one of the top bag designers fashion women covet. You can purchase this bag here. We have found you a very affordable replicate here. Lady Louise accessorised with a large vintage style pendant, which looks to be a cushion cut clear stone, suspended in a circle of other clear stones.